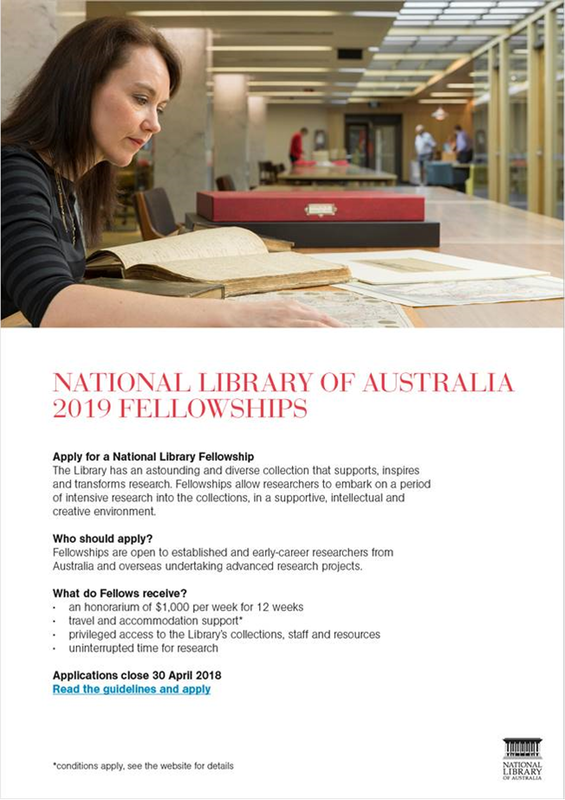 Applications are open for the 2019 National Library of Australia Fellowships<https://www.nla.gov.au/awards-and-grants/fellowships-and-scholarships/national-library-of-australia-fellowships/fellows> which support 12 weeks of intensive research using the Library’s extraordinary 10 million item collection. Fellowships are awarded in several categories, including the recently created Curatorial Fellowship, and are assessed on merit. Applications are welcomed from established and emerging scholars, researchers and professionals from Australia and overseas. The closing date for applications is 30 April 2018, and some Honorary Fellowships may also be awarded. We would be very grateful if you could assist with promoting the 2019 Fellowships round by circulating this e-flyer (as attached or as below) to relevant contacts and email lists.